New breakthrough in the United States for Marie-Andrée Ostiguy! 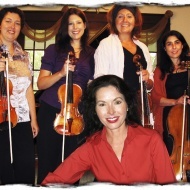 Marie-Andrée Ostiguy and her musicians, the Artémuse String Quartet, are part of the official selection of the "Performing Arts Exchange 2009" in Norfolk, Virginia. To learn more about the showcase of Marie-Andrée Ostiguy and the Artémuse String Quartet at PAE, download our press release.